SyntaxEditor for WPF has a free add-on included with it that provides integration with ANTLR 3.4 parsers. The add-on is described in detail in this blog post from several years back. ANTLR, ANother Tool for Language Recognition, was created by Terence Parr and is one of the most widely-used parsing frameworks available. ANTLR is a framework for constructing recognizers, interpreters, compilers, and translators from grammatical descriptions containing actions in a variety of target languages. ANTLR provides excellent support for tree construction, tree walking, translation, error recovery, and error reporting. SyntaxEditor for WPF customers know that we also have our own LL(*) Parsing Framework that has a lot of benefits over ANTLR, but due to the general popularity of ANTLR, we are pleased to support it as well. In the past few months, ANTLR v4 was released. There is updated tooling for Visual Studio that allows ANTLR v4 parsers to generated. The thing is that the entire infrastructure of ANTLR parsers has changed in v4, and with those breaking changes, it prevents our add-on from working. In ANTLR v3, you could run the parser on the document text via our add-on (and in a worker thread so it doesn't block the main UI thread), and it would return the AST results of the parsing operation asynchronously when it completed. In ANTLR v4, the parser is not the same as there is no automatic AST generation. Parse results can be examined via the use of the visitor pattern or a parse tree walker. If you wish to have your own AST, you have to roll your own and construct it using a visitor or walker. This change negates a lot of the features our add-on provided since now, you basically must hand code an IParser service to install on your language. SyntaxEditor is fully extensible for any custom parsers, so this can be added easily. It's just that whatever code you need to do to generate an AST or other parse data by walking the parse tree must now be custom written. We are writing this blog post to see what you, our customers, would like to see from us in terms of ANTLR support. Do you still wish to have our add-on support ANTLR v3 as we move forward? The only piece that is really useful from our ANTLR add-on when used with the newer v4 design is the ICharStream implementation that allows the parser to directly read from our text storage facility. Since it's only one class, do we just include it open source somewhere or make a separate v4 binary with it in there? We'd love to hear your thoughts… Please comment below or email our support address! Code Writer v2.2, our free text/code editor app, is now live in the Windows Store. This version focuses on adding major new find/replace-related features. Are you interested in adding code or text editing abilities to your own Windows Store apps? SyntaxEditor for WinRT/XAML was recently released, allowing you to build apps just like Code Writer. Download a free evaluation to try it out. 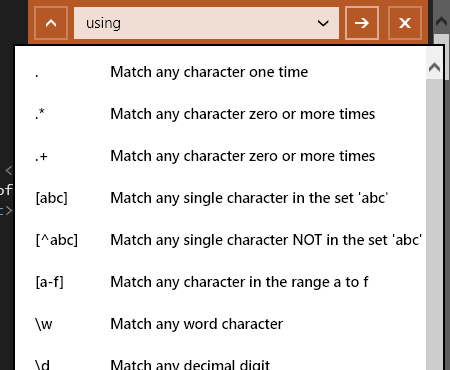 The Find/Replace Pane now includes search options for match case, whole word, and use regular expressions. The selected options appear in subtle small text below the Find What field. If no options are selected, that entire text row disappears so no screen space is wasted. Drop-downs with insertion options for find/replace fields appear when in regular expression mode. In the screenshot above, the Find What field's drop-down button is clicked, displaying a popup menu of available regex syntax options. Incremental search is a way for the end user to quickly search for text in a document without needing to interact with search dialogs or panes. With a couple keyboard strokes, the end user can instantly start searching for text. Ctrl+I enters the new incremental search mode, which is a feature that allows for fast text searching via the keyboard. Ctrl+Shift+I searches backward. See this previous blog post on how incremental search works. An editor settings option has been added for the new search match highlights feature. Search matches are highlighted in the editor, even as you change search options in the Find/Replace Pane. In the screenshot above, we have searched for the text "using", and all instances of it are automatically highlighted. Ctrl+F3 will find the next instance of the currently-selected text. Delimiter auto-completion logic is now a lot smarter as detailed in this blog post. 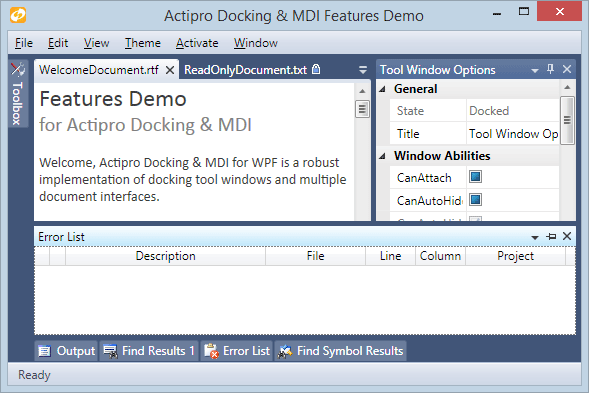 Improved logic to prevent opening multiple instances of the same document. Documentation on touch interaction in the Editor screen. Fixed issue with touch-based scrolling working in certain scenarios. Fixed where Ctrl+Tab was cycling two documents forward instead of one. Fixed unsaved documents showing empty tab tooltips. This update significantly improves the searching features of Code Writer and we highly recommend that you upgrade to it. In this quarter we published the 2013.2 version of our WinRT/XAML controls, as well as large maintenance releases of our other products with a lot of new features. Our free Code Writer Windows 8 app saw a new release that added support for Windows 8.1, and took advantage of new UI concepts available in that version. Behind the scenes, we also completely restructured and improved our internal process for source code management and build processes. These updates have streamlined our day-to-day work and will allow us to serve our customers better. We are back from the holiday break and ready to dive right into new product development, along with enhancements to our existing controls, especially SyntaxEditor.